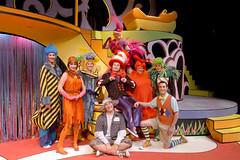 Embrace the wild and whimsical world of Dr. Seuss as it has never been seen before! Classic stories including Horton Hears a Who, Gertrude McFuzz and The Cat in the Hat collide in this musical extravaganza with all of your favorite Dr. Seuss characters. These stories, brought together by Jojo, a young boy and â€œthinker of strange and wonderful thinks,â€ is really about believing in yourself, keeping promises and the rewards of being an independent thinker. People of all ages will enjoy this wild and powerful musical adventure that will keep your feet a tappinâ€™ and children a laughinâ€™! No Way…!! !Â Subscriptions to the Arvada Center’s amazing season were all but sold out last week, but since they’ve added an additional week to the smash hit Les Miserables, subscription package are again available. Packages are limited since there are only a few remaining dates to Les Mis, so your best bet is to call the Box Office directly at 720-898-7200.
o	HOLLYWOOD ARMS â€“ a dramedy set in 1940â€™s Hollywood, fashioned after Carol Burnettâ€™s actual Memoir. o	A WONDERFUL LIFE â€“ based on the classic holiday movie starring Jimmy Stewart. o	THE CRUCIBLE â€“ a gripping drama set during the Salem witch trials. o	EVITA â€“ the well known, larger-than-life modern musical. o	BIG RIVER â€“ the adventures of Huckleberry Finn, based on one of Mark Twainâ€™s greatest novels. Single Tickets are also available for all of our upcoming shows by calling our Box Office or Online at ArvadaCenter.org. The Arvada Center for the Arts and Humanities has now extended the critically acclaimed Les MisÃ©rables though October 25, 2008. Tickets are on sale now and are expected to sell fast. The Arvada Center’s critically acclaimed epic musical Les Miserables extends through October 25. Tickets are now on sale and are expected to sell out. Fresh off a three week run of Les MisÃ©rables at Maine State Music Theatre in Brunswick Maine, Dennis St. Pierre has arrived in Arvada, is currently in rehearsal and is expected to step into the lead role of Jean Valjean this weekend. According to Kathi Kacinski with Maine State Music Theatre, â€œ[Dennis St. Pierre] can bank on this role for the next 15 years. Heâ€™s passionate about the role and audiences will love him.â€ Dennis has been seen on six Broadway national and international tours, starred in an off Broadway show and worked for over 30 theater companies throughout the U.S. Favorite credits include Man of La Mancha, Secret Garden, Miss Saigon and Loves Labours Lost. Dennis also made TV guest appearances on The Practice, Ally McBeal, NYPD Blue, Passions and Ed. As a singer, he appeared as a soloist throughout Europe and has recorded demo songs for artists such as Josh Groban, Elton John and Celine Dion. The continued extension of Les Mis will run through October 25, with performances on Tuesday â€“ Saturday evenings at 7:30 p.m.; Saturday and Sunday matinees at 2:00 p.m.; Wednesday matinees at 1:00 p.m. There will be no matinee performances on Wednesday, October 22 and Sunday, October 25. For Tickets call (720) 898-7200 or visit arvadacenter.org.